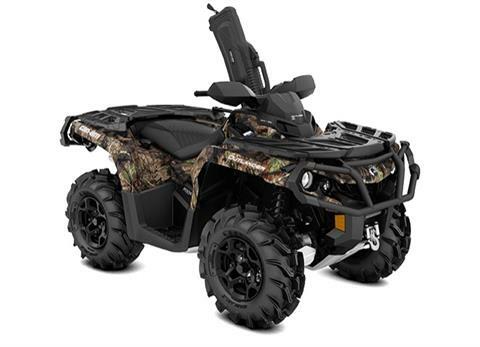 Combine Mossy Oak’s new Break-Up Country pattern with factory-installed hunting accessories and the power of the Rotax® 1000R engine and you get the ultimate hunting package. 89-HP ROTAX 1000R V-TWIN ENGINE: The most powerful ATV engine in the industry. Fed by a 54 mm throttle body and twin Siemens VDO fuel injectors for precision throttle control, it also provides a smooth mid-range power delivery. KOLPIN 6.0 IMPACT GUN BOOT: Features largest holding capacity of all Kolpin Gun Boot cases. Extra room for pistol-grip-type weapons and small bipods. Easily fits firearms up to 51 in. (130 cm) in total length. 3,000 LB. (1,361 KG) WARN† WINCH WITH ROLLER FAIRLEAD: The 3,000 lb. 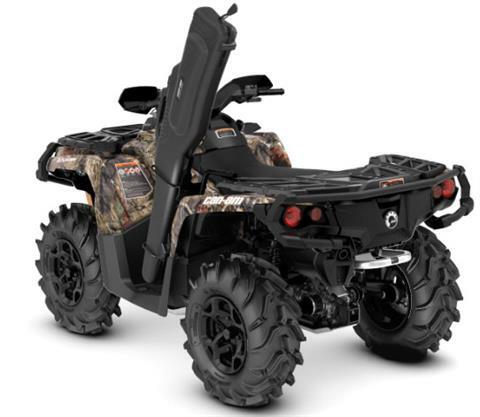 WARN ProVantage 3000 winch features a roller fairlead and a fully sealed motor. The rugged, dependable winch can haul out big game and get hunters out of a tough situation if needed. FRONT, CENTER & FOOTWELL SKID PLATES: Made with high strength 5052 H32 aluminum. A must-have for rugged terrain. 12 IN. (30.5 CM) CAST ALUMINUM WHEELS WITH 26 IN. (66 CM) CARLISLE ACT HD TIRES: 12 in. (30.5 cm) cast-aluminum wheels black painted. The centerless design reduces unsprung weight and offers improved strength. The 26 in. (66 cm), 6-ply Carlisle ACT HD tires feature a tread pattern that is aggressive enough to tackle tough terrain, yet provide a smooth ride.